This function will write the legend of your data series based on the description tag specified using the setScatterSerieDescription function. It is possible to tune the rendering by playing with the $Format array. To learn more about this please read the Format array guide. 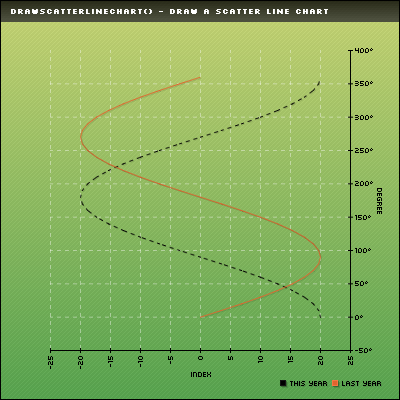 This function accept the same parameters than the drawLegend function. If you want to specify multi-line labels then you can use the "backslash n" line break character in the serie description tag. This function preserves your serie special settings (ticks, weight) only in the LEGEND_FAMILY_LINE mode. X and Y are the coordinates where will be drawn the legend. Customisation array - Tune up your legend! It is possible to customize the way your legend will be rendered by playing with this array. Providing a detailled configuration is not mandatory, by default the legend will be drawn in a soft grey box with curvy corners. You can specify the font file that will be used with FontName. You can specify the font size with FontSize. You can specify the font color with FontR, FontG, FontB. You can specify the width of the colored boxes with BoxWidth. You can specify the height of the colored boxes with BoxHeight. You can specify the inner margins with Margin. You can specify the background color with R, G, B. You can specify the background alpha with Alpha. You can specify the border color using BorderR, BorderG, BorderB. You can use the Surrounding option to define the border color. This value will be added to the R,G,B factors to define the border color. LEGEND_NOBORDER no borders will be drawn around the legend. LEGEND_BOX a rectangle will be drawn around the legend. LEGEND_ROUND a rounded rectangle will be drawn around the legend. LEGEND_VERTICAL that will stack vertically the series. LEGEND_HORIZONTAL that will stack horizontally the series. LEGEND_FAMILY_BOX to use filled rectangles. LEGEND_FAMILY_CIRCLE to use filled circles.